This is a guest post by Stephen Barrett. If you want to guest post on Go Backpacking, please read more here. 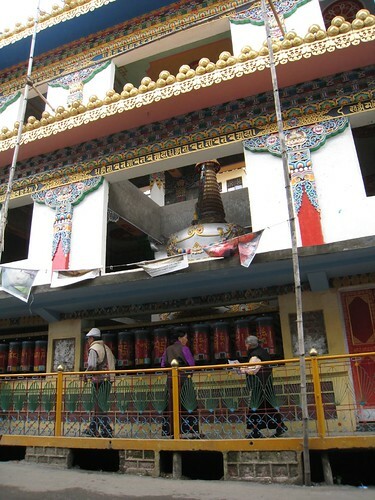 As part of a larger backpacking trip around the world, Stephen Barrett had the good fortune to be in McLeod Ganj, seat of the Tibetan Government in Exile, for the first day of a series of lectures given at his residence by Tenzin Gyatzo, His Holiness the 14th Dalai Lama. I wake up in The Lady's Adventure Guesthouse in the small town of Mcleod Ganj, high in the mountains of Himachal Pradesh State in northern India. It is a short walk uphill to the town's two main commercial streets to seek out breakfast. Like many westerners passing through Upper Dharamsala, I amble into Gakyi Restaurant and order momos (dim sum like veggie dumplings) and a cup of spicy ginger tea. It's a small place; the tables are close together which makes for a friendly atmosphere. The conversation around the room is polite and convivial. ” So, are you going to see the Dalai Lama today?”? I am asked matter of factly by a gentle looking Canadian guy in glasses, white kaftan and a long graying beard. Correctly reading my blank stare as recently awoken and bewildered by his question, he kindly elaborates. The Dalai Lama is in residence and will be giving two talks per day for the next three days. This surprise news brings me to my senses and I immediately start asking questions. I glean all the information I need from the customers of the tiny cafe, with people pitching in from every table in the place. His Holiness would indeed be giving two talks per day at the request of a Buddhist group from Singapore and the talks were open to anyone who wished to attend. They would be translated into English and broadcast live on FM radio throughout the town. In fact the first of the talks is already underway and I realize it can be heard on the cafe's tiny transistor radio brought out especially for the occasion. There is no need to have booked months in advance or anything like that; all that is required is security clearance from the staff at the temple complex. One thing I love about India is the way the best laid plans so often change five minutes after getting out of bed. Today will be no exception. This is too great an opportunity to miss. There is no time to lose. 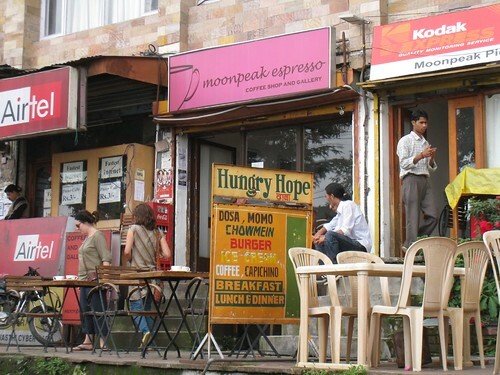 I wolf my momos, drain my tea and head through the town to seek out the compound's security team. Walking through Mcleod Ganj is like nothing I have ever experienced. The prayer wheels laid out along the side of the town's central temple face the main tourist and commercial street. This makes a quick spin of the wheels, and therefore a prayer, an almost involuntary action. As you pass them you can't resist holding out a hand to spin them, this in turn focuses your mind on the reason behind them and there you are, meditating, just for a moment, almost by accident. The wheels are just part of a colorful scene that constantly reminds the visitor that they are in a unique place of religious teaching and observation, yet it never overwhelms. Perhaps this is because the practitioners too are visitors of a sort to this country, already so rich and diverse in its spirituality. Witnessing older monks barter in markets and younger ones play basketball in the grounds of a monastery, or gompa, reminds you that this is a place where spirituality, pragmatism and fun can happily co-exist. The temple aside, Post Office Road is a mixture of small shops, cyber-cafes, treatment centers and travel agents all actively pursuing your tourist dollar. 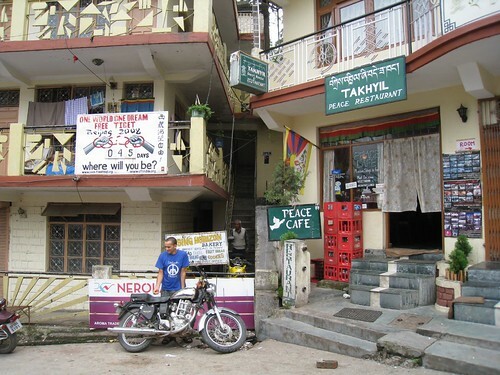 Tibetan influences are very strong with many family businesses proudly displaying the Tibetan flag. Turning to Temple Road, the other main street in the small town, things change. There is a panel of craft shops on one side with the usual phalanx of touts unashamedly cajoling tourists into splashing the cash. To the other side there is the Lha Charitable Trust which provides training, medical assistance, clothing, and clean water to those in need in the local community. The Trust also coordinates volunteer work and it's a great place to start to get involved and connect with the local community. On the other hand it also offers the chance to learn language, traditional drawing techniques or craft skills native to Tibet. Heading down the hill to the Tsuglagkhang Temple complex is a fascinating stroll. To the right, in the distance, there is the breathtaking view of the mountains, lower lying farmlands and lakes. Much closer to you stands a line of chaotic stalls offering everything from practical hats, gloves, pots and pans, to the more exotic hand held prayer wheels, mini cymbals, inlaid daggers and sheaths. On the left, after the shops stuffed with counterfeit clothes and shoes there is a series of elevated pretty restaurants and hotels. Some of these would not look out of place in the middle of Soho. Western clientele recline outside, sip lattes and take advantage of a new WiFi service. The contrast between the two sides of the street is glaring. In every way except geographically, the other side of the street is a million miles away for the impoverished stall holders. As I approach the compound entrance, the crowd intensified along with the stray dogs, hawkers and many disfigured people asking for alms. Most of these people have fingers, toes, hands or feet missing as a result of frostbite caused by the fierce conditions encountered when crossing the Himalayas from Tibet. They fled from Chinese rule, often by night, often leaving friends and family behind. The Dalai Lama himself undertook this arduous journey back in 1959 to claim exile here and so begin a new chapter in Tibetan history. Getting into the compound is relatively straight forward, I am simply told to come back with my passport and two passport size photographs. A quick dash back to the guesthouse and a brief stop at the small shop of two young entrepreneurs with a camera and a printer sort this out. Within fifteen minutes, I return and collect my pass for the afternoon session. Now all that remains is to wait. About the Author: Stephen travelled the world in 08 and 09 and actually made a few dollars with a few little tricks along the way.